Who can recognise this locally grown produce? Can such a country viz. Pakistan be taken seriously for advocating the right to self-determination of the Kashmir Valley? For how much longer do we have to tolerate this hypocrisy? Sustainability > Sequence > Synchronisation of public interest is what we're after, as intimated in an earlier blog post. This is part of my country but I can't travel there at will. I can't think of a better place to spend a winter morning in. This 'incident' occurred this evening at Battal (tehsil Hajeera) - near the LOC - where the Pakistani army man a checkpost. They were not allowing the party cadre of JKNAP (Jammu Kashmir National Awami Party) to proceed to their party convention in Kotli. Sanity prevailed soon after as no army can prevent an organised public group from travelling within their homeland. How it could have been different? Have accomplished quite a bit in the past 24 hours but can't really show much for it. Perhaps a bit like how the engineering quality of a car isn't quite visible from afar. Invited impromptu to the following Cross LOC talk show....Discussing re-opening Sharda and other places of worship in AJK. The programme is taking its cue from Kartaarpur movement between India and Pakistan in Punjab today. This shows both countries are more friendly to each other than they are to us.. Being organised has got to be a virtue, even though it takes so much time to attain it. The Shahid Afridi issue has startled many a citizen of AJK and here are two very well presented takes on what is referred to in Pakistan as the 3rd option viz. Independence of Jammu & Kashmir. When I'm just engaged in data organisation at home - like I was yesterday - other matters of public interest suffer. Everything seems to be a race against time. 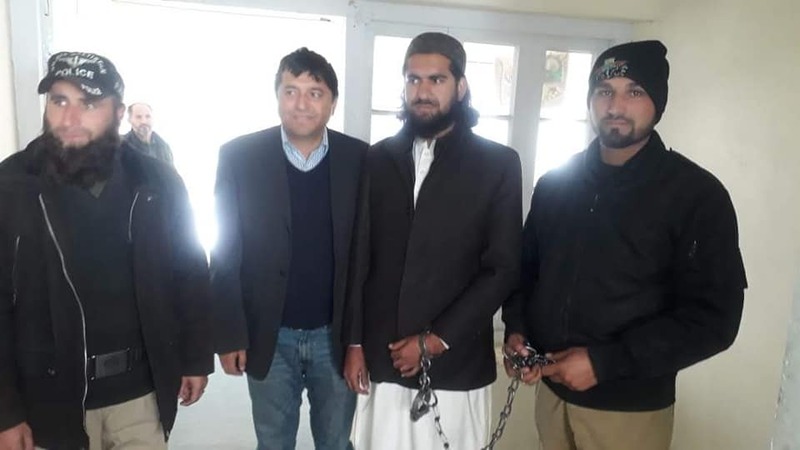 Momentum is building over the arrest of Maulana Sultan Raees, leader of Awaami Action Committee Gilgit Baltistan (AAC-GB). He's also been unanimously nominated by various wings of civil society in AJK to be their declared representative in policy matters where AJK and GB converge. 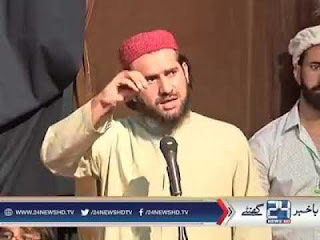 In our opinion, he is being victimised by the Pakistani State for attending a seminar in AJK, in particular. We appeal to all democratic and justice-loving people to protest against the arrest of Maulana Sultan Raees, who chairs the people's Action Committee (AAC-GB-AJK) which comprises of several political and religious parties (and groups) from Azad Jammu & Kashmir (AJK) and Gilgit Baltistan (GB). 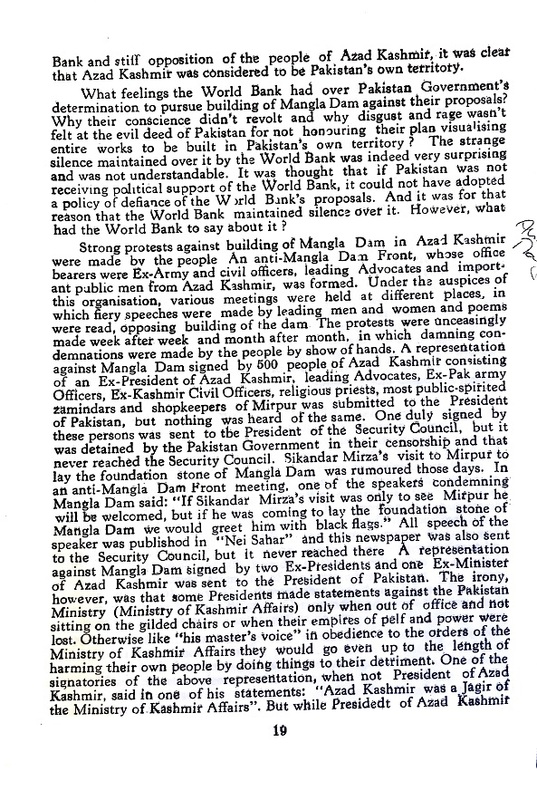 Both territories are being controlled by Pakistan that has discouraged and disrupted communication between the people of two territories (GB and AJK), which were both parts of the United States of Jammu Kashmir until 1947, when India and Pakistan clashed over this territory, thereby forcibly dividing it. 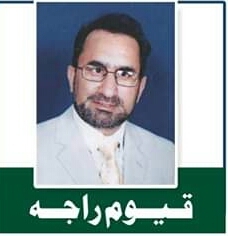 The only crime of the arrested leader is that he attended a seminar held in Mirpur (district capital of AJK) by the Azad Jammu Kashmir Syllabus Action Committee, chaired by this writer. 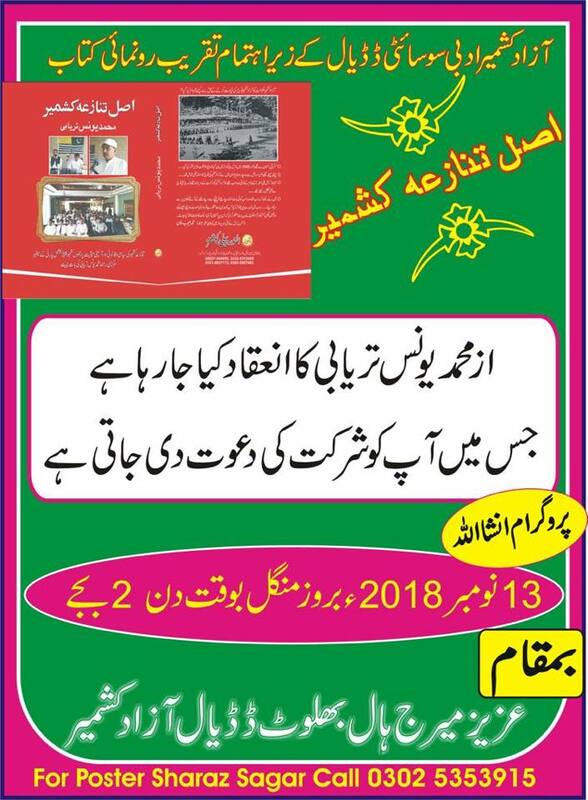 We have been campaigning for the inclusion of Jammu Kashmir history into our national curriculum here, which is also controlled by Islamabad. We believe that it is the right of Kashmiri children to study their history like all other nations. The update above was supposed to have been written yesterday. Events do move forward faster than one individual can possibly find the opportunity to write about. In this inter-connected world, many activists simultaneously engage on addressing the authorities' cruelty, at home and abroad. 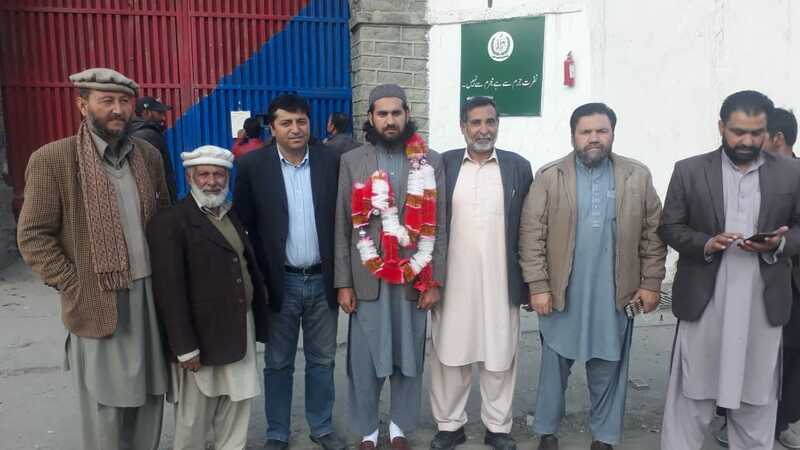 As a consequence, Maulana Sultan Raees was released on bail from Gilgit jail this afternoon, after 4 days in captivity. Meanwhile, on a more shallow note, I've been able to blog daily for 68.2% of the year so far. Let's see if the percentage can increase by day 365 on December the 31st 2018. Now, this is a serious bit of history which almost links my village to my State: Jammu & Kashmir. Apologies for keeping it from you since I received it in 2011, thanks to Yahoo and my co-citizens from across the LOC. And مکمّل تاريخ پونچھ / خوش ديو مينى. Mukammal tārīk̲h̲-i Pūnch / K̲h̲ūsh Dev Mainī. After the massive earthquake of 8th October 2005 on both the sides of LOC, a 45 kilometer long Mendhar-Kotli road across the LOC was opened for meeting of the divided families for the first time after 58 years on 17th Nov. 2005. The divided families on both the sides were allowed to visit the other side, to meet their kith and kin via Tata Pani Balnoi crossing point. 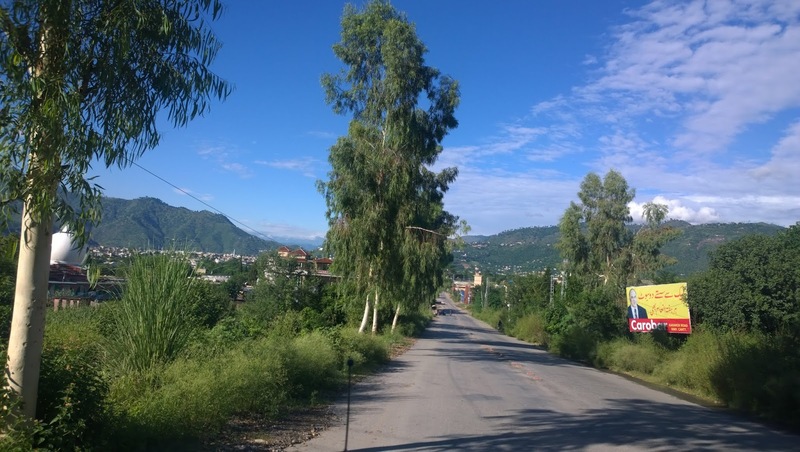 However, later on when Poonch-Rawalakote road across the LOC was opened, Mendhar-Kotli road via Tata Pani was abandoned after 20th June 2006 and Kotli was linked with Poonch via Chakan-da-Bagh Zero point. Therefore, the old relations were revived and new contacts were established due to people to people meeting with the habitants of Kotli. In 1947, there were two routes leading towards Kotli from Poonch. First was a motorable road from Poonch via Mandole-Tatapani and the second was a bridal path connecting Kotli with Mendhar via Sona Gali Pass. At the time of partition in 1947, there were about 700 houses in Kotli town apart from a established Bazzar of an ancient time. Most of the houses were single storeyed buildings made of mud and boulders while some pacca houses were also existing in the town. Kotli was a tehsil headquarter of district Mirpur. There was also an old Baradari situated at the edge of Poonch river constructed with bricks and lime. There were three Hindu temples and a Dharamshala, two mosques and number of water mills. Kotli was a Mandi of food grain and wool products. The climate of the town was a bit hotter than Poonch town. The town was dominated by Hindu and Sikh families. There were about 4000 Hindus in Kotli town at the time of partition. Mostly they were traders. There was a complete communal harmony between Hindu and Muslims in Kotli town. The habitants were participating in the religious and social functions of each other. However during the turmoil of 1947 the Hindu and Sikh population of Kotli town and surrounding villages was forced to migrated on this side of LOC and they never got opportunity to go back in their native areas. Presently the migrants of Kotli have been settled in Nowshera, Jhangar and Jammu area, but their sentiments are still with with Kotli. With the opening of Poonch-Rawalakote road, the migrants of Kotli have again started dreaming of visiting Kotli, the land of their dreams. Presently Kotli is a district headquarter in POK with three tehsils namely Sensa, Nakyal and Kotli. The district is located on the southern side of tehsil Mendhar of Poonch district. 55 kilometers LOC divides Kotli from Mendhar. As per Raj Tringani the original name of Kotli was Kalanger. Around 1120 AD Padma Vat was the Raja of the Kalanger principality. When King Susal of Kashmir was defeated by Bakachar, he had taken refuge in Kotli. In this very period King Susal had married the daughter of Raja Padma Vat of Kotli and finally with the help of the Raja of Kotli, Susal invaded Kashmir, defeated Bakachar and became the King of Kashmir. Kotli remained governed by local Hindu Raja's upto 14th century AD. In 1339 AD, when Kashmir was taken over by Shah Mir, the influence of Islam started increasing in the princely states of Pir Panchal region including Kotli. 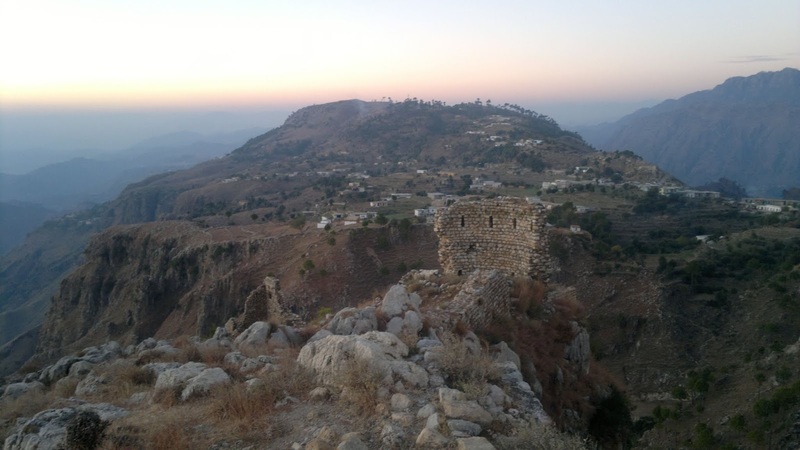 In 1452 AD when Sultan Zain-ul-Abdin established an outer hill state comprising of Poonch-Nowshera district, Kotli principality was dissolved and merged with new principality. With the passage of time, majority of the habitants embraced Islam in this area. In 17th century AD a new principality of Muslim Mangral Rajput Raja's came into existence with headquarter at Kotli. 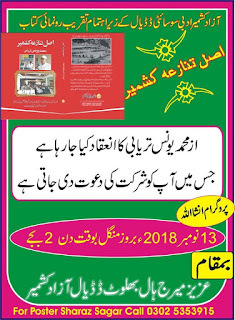 As per Tarikh-e-Aquama-e-Poonch Part-II, in the ancient time Kotli was ruled by Mangral Hindu Rajput Raja's with the headquarter at Sensa. The Raja of the third dynasty was Sansar Chand who embraced Islam and shifted his headquarter from Sensa to Kotli. The Muslim Mangral Rajputs ruled Kotli upto 1819 AD. However, they were dominated by Chib Rajas of Chabal. As per Tarikh-e-Rajgan-e-Jammu and Kashmir, in 1808 AD, Gulab Singh was a common man known as Gulabu. His father Kishora Singh borrowed some money from a trader Dulu Shah and purchased two horses for his sons - Gulab Singh and Dayan Singh. He directed them to join the forces of Maharaja Ranjit Singh. However bessiged due to confrontation with Mian Mota, Gulab Singh and Dayan Singh could not meet Maharaja Ranjit Singh in Lahore. Therefore, they decided not to join the forces of Maharaja Ranjit Singh and moved back towards Jammu. When they reached Chabal area they joined the forces of Chib Raja Sultan Khan of Chabal. At that time Kotli was a Jagir of Mangral Rajas and a part of Chabal principality. Sultan Khan appointed Gulab Singh as a Qiladar of Kotli. Therefore Gulab Singh reached Kotli, took the possession of the fort and started collecting revenue on behalf of Raja Sultan Khan of Chabal. However Gulab Singh was not in good terms with the wife of Raja Sultan Khan whose name was Hayat Khatoon. One day when Gulab Singh was present in the court of Raja Sultan Khan his wife Hayat Khatoon abused Gulab Singh. At that very movement Gulab Singh left the services of Raja Sultan Khan and returned back to Jammu. Later on, Gulab Singh and Dayan Singh joined the forces of Maharaja Ranjit Singh. In 1814 AD during the first attack of Maharaja Ranjit Singh on Kashmir his forces were beseiged at around Poonch due to unexpected revolt of Raja Ru-Alla-Khan of Poonch. At this stage the Rai (Jagirdar) of Kotli helped the forces of Maharaja Ranjit Singh. There was disturbance and revolt in Kotli area after 1820 onward against the rule of Khalsa Darbar Lahore. To subside this revolt, the Kotli and Chabal area was given by Maharaja Ranjit Singh to his Prime Minister Raja Dayan Singh as a gift in 1827 AD. Dhayan Singh received a tough resistance from Mangral Rajputs of Kotli in between 1827-1846 AD. In this disturbance, most of the Mangral Rajputs of Kolti had left their native villages and migrated towards the remote areas of Pir Panchal range. In 1852 AD when Poonch-Chabal Jagir was divided into two parts, Kotli had become the part of Chabbal principality of Raja Jawahar Singh. But Raja Jawahar Singh had never came to Kotli-Chabal area and this principality was confesticated by Maharaja Gulab Singh in 1856 AD. Kotli remained the part of J&K State from 1856-1947 AD. In 1947 Kotli was defended by a company of state forces. 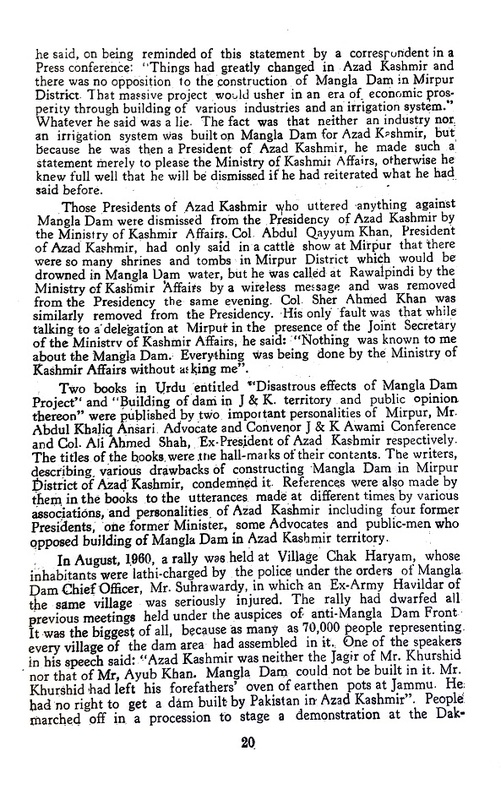 During the turmoil of 1947, the rebels with the help of Pakistan armed forces and tribesmen of NWFP revolted against state forces. The state forces could not hold the area and the scattered contingents retreated towards Kotli. The town was besieged by the rebels. In these circumstances Colonel Baldev Singh Pathania was appointed as guide to state forces for operation against the rebels under the overall commanded of Brigadier Chattar Singh who was stationed at Mirpur. The city was besieged from all the sides. About 5000 Hindus from the surrounding areas had also taken refuge in the town. There was acute shortage of ammunition and it was not possible for the state forces to hold the town. The Indian air force in the month of November, 1947 dropped some boxes of ammunition in and around Kotli town. Unfortunately these boxes of ammunition were captured by the rebels. However 17 boxes were snatched by the civil population. In the meantime Indian forces started operation from Jammu side and reached Jhangar under the command of Brigadier Pran Japi. On 12th November the advance towards Kotli was started by Brigadier Pran Japi from Jammu towards Akhnoor for the relief of Kotli town. On 13th November the advancing forces reached Akhnoor, on 16th November they crossed Bari Pattan Bridge and rushed towards Nowshera. On 19th of November Jhangar was captured. On 26th November Indian troops marched towards Kotli and entered the town at 2.20 PM after defeating the rebels in and around the town. Brigadier Pran Japi found that about two companies of state forces in Kotli were completely demoralized. 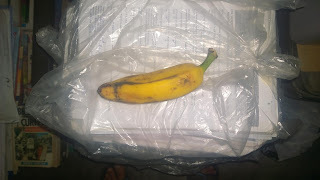 There was severe scarcity of food grain, medicines and consumable items in the town. The habitants were drinking water from a filthy pond in the town. There was a demoralized civil population of about nine thousands. 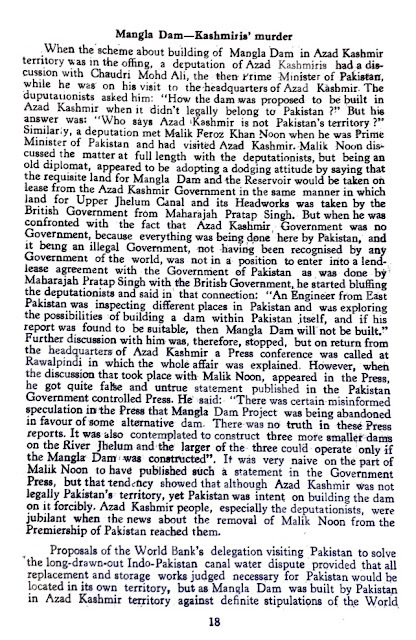 It was not possible for the forces of Pran Japi to hold the Kotli town because the town was 147 miles away from Jammu. Therefore it was decided not to hold the town. 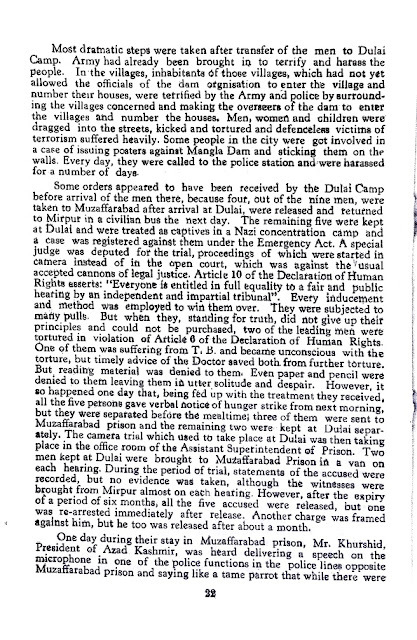 In these circumstances Brigadier Pran Japi vacated Kotli town on 28th November 1947 along with nine thousand refugees. The caravan reached Jhangar on the same day and the ancient Kotli town was captured by the rebels. A mind with vast spaces of emptyness......is that still possible in this information cluttered world? I had watched this video a few days ago and even though I have a dedicated blogger page for the study of Water I feel compelled to add this here too, as it is taking up more of my time gradually. 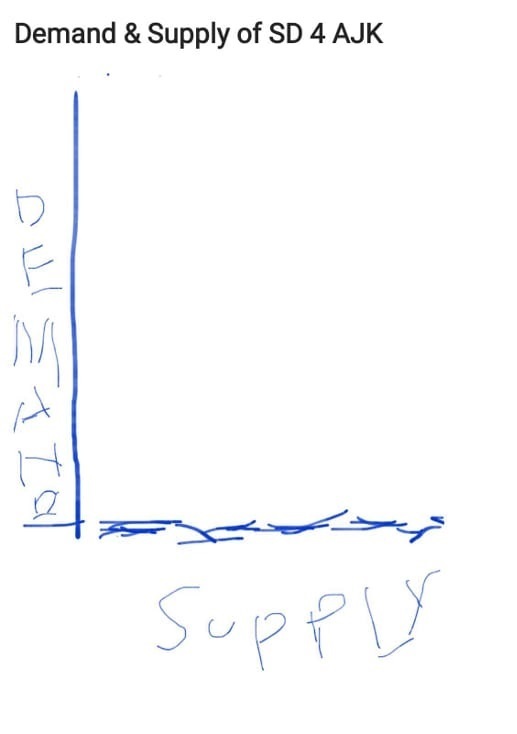 The will of the people has to have a demand/supply diagram. It's not about what you're entitled to, it's about what you do to attain your title. Self-determination (SD) is a verb, like fighting or struggling. 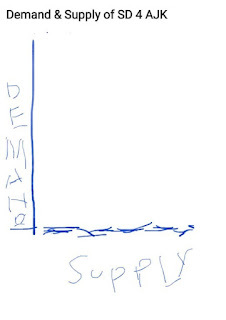 The diagram would be what we're entitled to (demand) compared to what we're doing (supply) to attain it. If there is a demand, then there must be a supply. We are the ones doing the demanding, yet are short on supply. Meanwhile, the Shahid Afridi suggestion for India and Pakistan to militarily vacate the State of Jammu & Kashmir, was met with contempt and accusations of 'traitor' by some politicians of AJK. 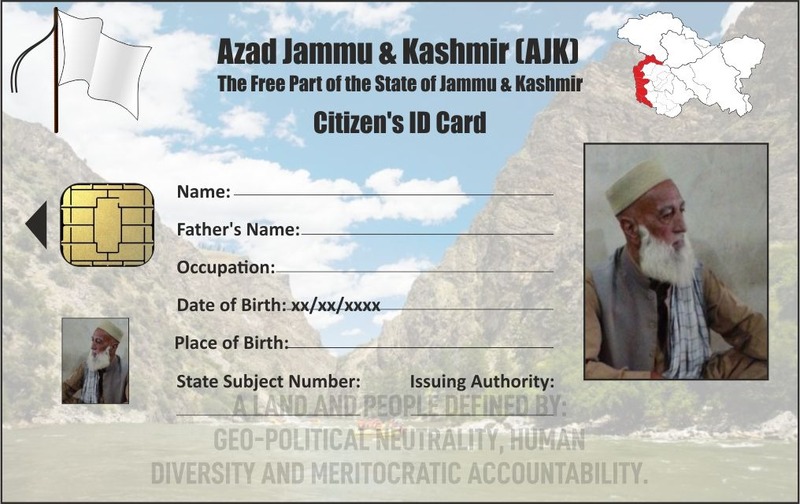 In other words, politicians who have been 'mandated' by the public of AJK to represent the public of AJK, are accusing a Pakistani citizen of mutinying against the Pakistani State. 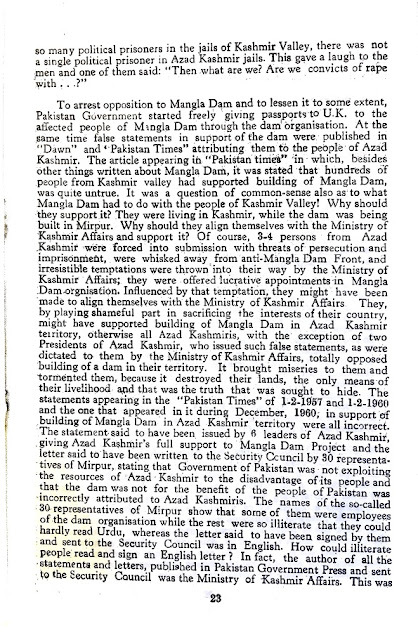 For what they perceive to be a betrayal of Pakistan's claim on the State of J & K.
Bizarre: The politicians of AJK are representing the aspirations of the Pakistani State while a Pakistani sportsman is being victimised for supporting the aspirations of the actual owners of the State of J & K.
In this Urdu news item, Quayyum Raja is advising the 'power hungry' to flock over to Islamabad and Delhi to sweep the floors there. The 'authorities' in Gilgit Baltistan (GB) are upping the ante against 'construction of civil society links between AJK and GB'. 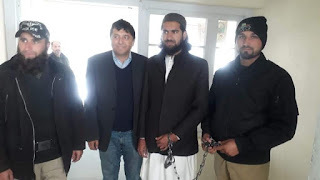 Maulana Sultan Raees, leader of Awami Action Committee (AAC) was arrested earlier today, while in court for a hearing on an 8 year old case and shifted to Central Jail, Gilgit. All 3 terms are major attributes needed for a successful transition from subject to citizen in AJK. The opposite of all 3 are in abundance here and in the diaspora. It is no wonder that we can't counter external influence in what should be a dominant public narrative here. Shahid Afridi didn't just upstage Raja Farooq Haider in the power corridors of London....his 'hit' comment gave the people of Jammu & Kashmir a seemingly unassailable lead in the subtle propaganda war over this territory. Then, the infamous big-hitter on the cricket field was run out! As clear a forced retraction as any I can think of. Remember, Shams is the independent researcher who upstaged Lord Nazir in Ireland last month. On this occasion, Shahid Afridi upstaged the AJK prime minister Raja Farooq Haider. What the latter should've been lobbying to explain to one set of British parliamentarians, a Pakistani cricketer decided to do to a different set of British parliamentarians. The AJK politician seemed meek and almost unsure to his audience. The Pakistani sportsman was bold and clear to his. Fast...slow........uphill...downhill......imagination and intellect.........right and wrong....future and history.......poverty and power. Just in time and not for the first time! Just back home from a wonderful evening. Our occupiers are in a fix at the moment. Their most potent weapon is propaganda but it is becoming toothless with the passage of time. It seems that they are busy searching for a way of countering the tide. I don't normally like speculating on what they are doing or not doing. I prefer to concentrate on what I'm doing and need to do, from day to day. Although I only spoke for about 20 minutes, I have written an 11 page review of the book, which I aim to share here shortly..
Realised at about 0002hrs that I was supposed to write an entry for Day 315. Absent-mindedness is dangerous. For those of you unfamiliar with Urdu, the name of the book is 'Asal Tanaza Kashmir' which translates as 'The Actual Kashmir Dispute'. The event will take place at Aziz Marriage Hall in Dadyaal at 1400hrs (13/11/2018). As I continue to wade through the mounting TB (terabyte/s) of data in my possession, I am close to establishing a pattern of categories. I am also spending some of my god-given time to approach 'fresh' members of the public, to acquaint them with my work (for them) and enquire on how they can possibly assist me. I am almost at the stage of being able to put up a monthly income/expenditure chart, which will provide further insights into what's missing in our rights struggle. 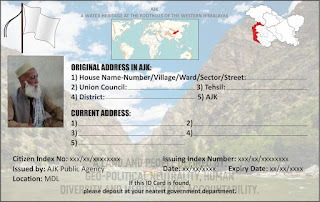 This is all in aid of improvising a solution for AJK's ambiguous status. The Mangla Dam was built because of the obligations that Pakistan accepted by signing the Indus Basin Waters Treaty. 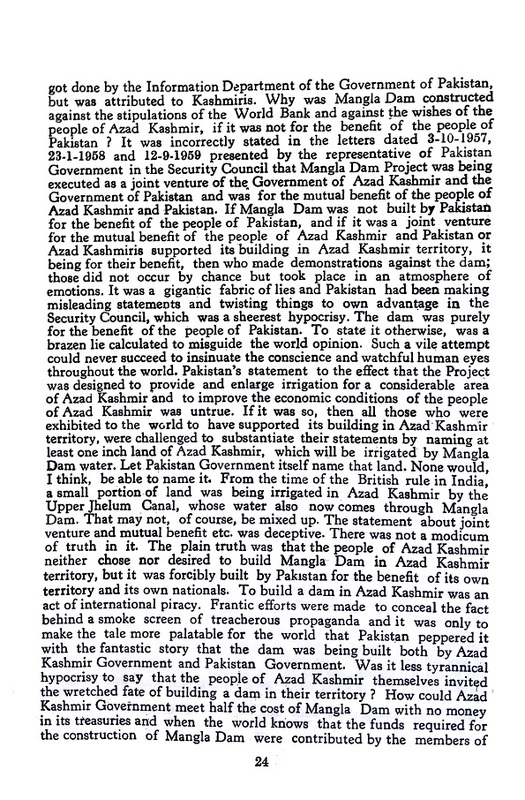 This monstrous manmade wall that played havoc with the topography and environment of the area was built on territory over which Pakistan had no legal or constitutional right since it was a part of the old state of Jammu and Kashmir, whose future, Pakistan otherwise maintains, remains to be decided in accordance with the UN Security Council resolutions and the wishes of its people. As was to be expected and as has consistently been the case, the people over whose land this giant dam was built were the very ones never consulted. 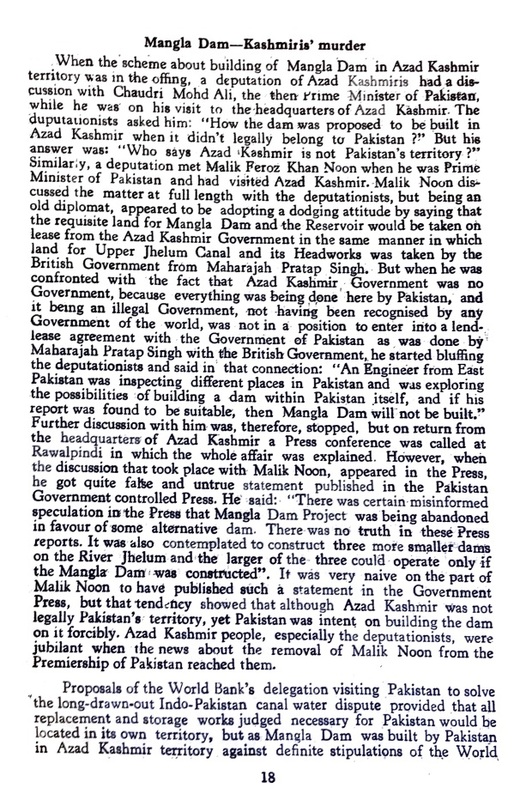 Mum’s the word when it comes to determining the extent to which the construction of Mangla has affected Pakistan’s case on Kashmir. After the transfer of some territory to China in Kashmir’s northern regions, again without consultation with the people of the state, this was the second major assault on the state’s territory. However, the saving grace of this treaty is a clause that in the event of a change of status, the treaty would be renegotiated with the controlling entity. 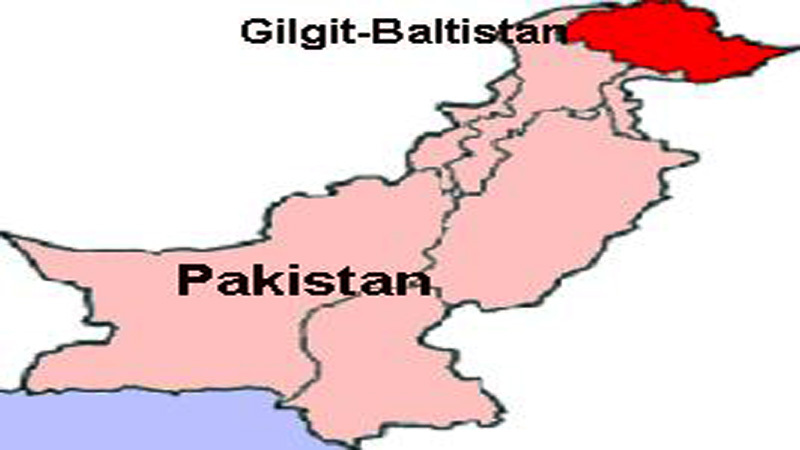 The Northern Areas are to this day administered from Islamabad and the so-called Northern Areas Council has no powers. But that is a tale for another day. 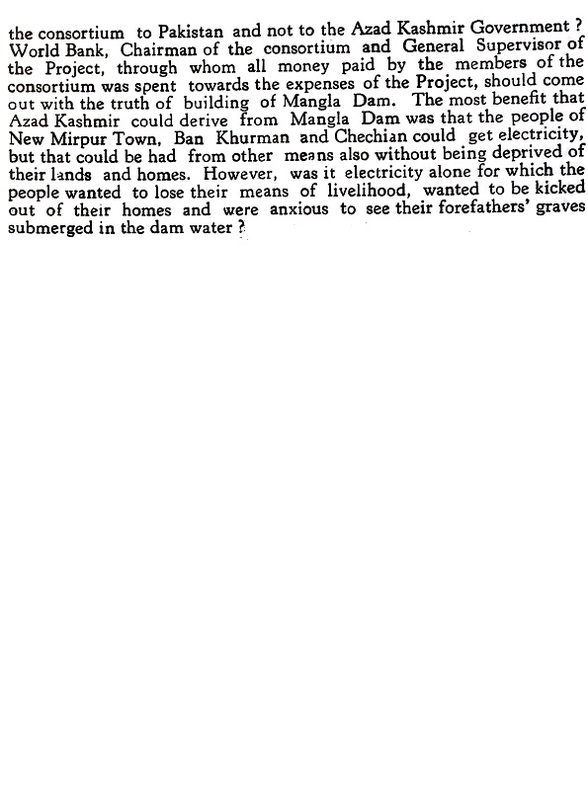 Recently, there has been talk of raising the Mangla Dam, a decision that only Barrister Sultan Mahmood, following in the footsteps of his father Chaudhri Noor Hussain, to his great credit opposed on the ground it would bring vast tracts of Mirpur lands under water, do violence to the environment and uproot the people who still have not forgotten or recovered from their forcible eviction from their homes so that the monstrosity called Mangla could be built. 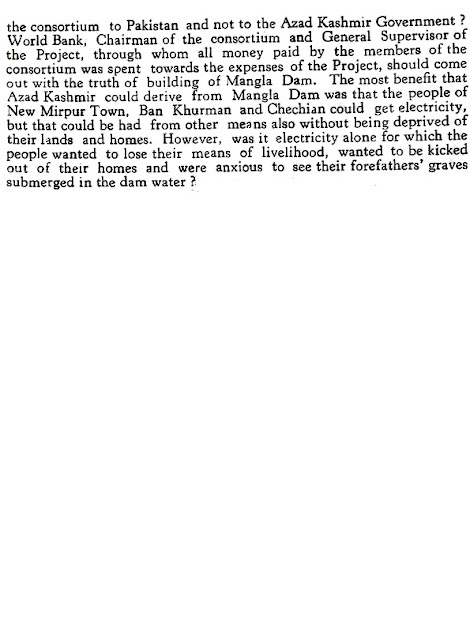 Forty years later, there remain many Mangla affectees, their claims for due compensation unresolved. Many were settled in areas far from their homes, such as Thal. Few of them stayed there but there was nothing to come back to because what were once their homes were now under water. What benefits Mangla has brought to Pakistan, it is for its government to list, but it has done little for Azad Kashmir or its people. The royalties that they should have been paid have always been in dispute and always in arrears. Unfortunately, there was no Arundhati Roy in Pakistan when Mangla was being built. I wonder if our own Arundhati Roy, the admirable Asma Jehangir, can be persuaded to join those who are opposing the raising of the dam. The people of Mirpur are settled in large numbers in Britain and it is their innate hardiness and their Spartan spirit that has enabled them to become one of the most prosperous and organised communities of expatriates in the West. They also remain the sole torchbearers for the Kashmir cause in that land, which seems now all but lost, given the recent declaration from Islamabad that the problem can be resolved in “one day”. 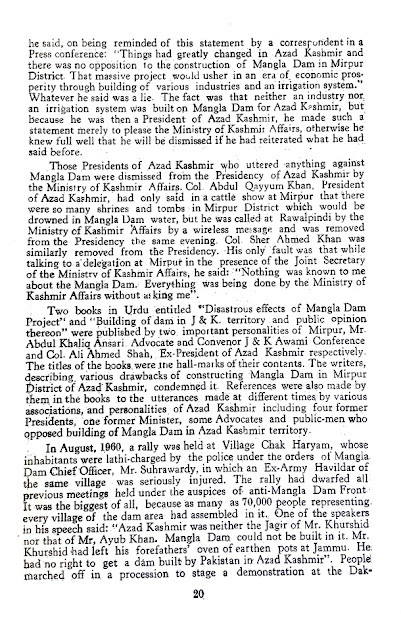 Very little has been written about Mirpur as it was before the Mangla deluge and even less about its pre-1947 days. 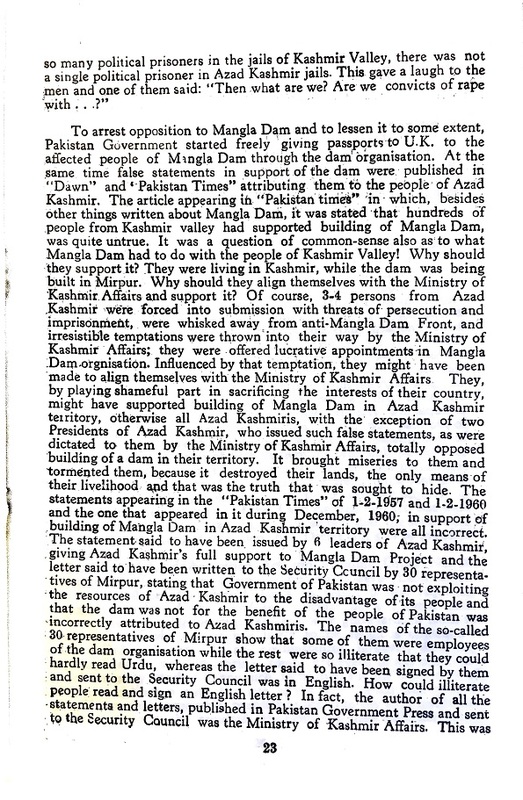 In 1995, one Mirpuri, Syed Sultan Ali Shah, published a book about Mirpur, containing his reminiscences of the city as it was before the partition of India, its people and its vanished landmarks. He had plans to produce a revised edition covering post-1947 Mirpur but, sadly, he did not live long to complete that labour of love. During the maharaja’s time, Mirpur was the headquarter of the district, which was known by the same name, and which included the three tehsils of Niabat, Bhimbar and Kotli. The administration was headed by a state official called Wazir-e-Wazarat and the magistracy was independent of the administration. Sardar Ibrahim Khan, who was a barrister-at-law from London, served as public prosecutor at Mirpur for a time, so did M Yusuf Buch as a young member of the Kashmir Civil Service. The valleys that lay between the hills had different settlements, some of them dating back to pre-Mughal times and peopled by different tribal and ethnic groups. There were 64 villages in Mirpur that were classified as jagirs and 336 others, both with Muslim majorities. There was an uprising against the Maharaja in 1931 in Mirpur and British troops had to be called in to restore order. 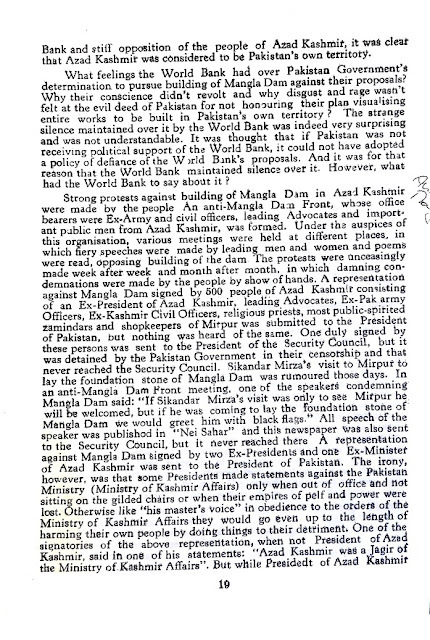 This became a turning point in the struggle of the Muslims for their rights and the All Jammu and Kashmir Muslim Conference was founded a year later by Chaudhri Ghulam Abbas and Sheikh Mohammad Abdullah (who formed his own party later – an event that marks the beginning of Muslim misfortunes in the state). 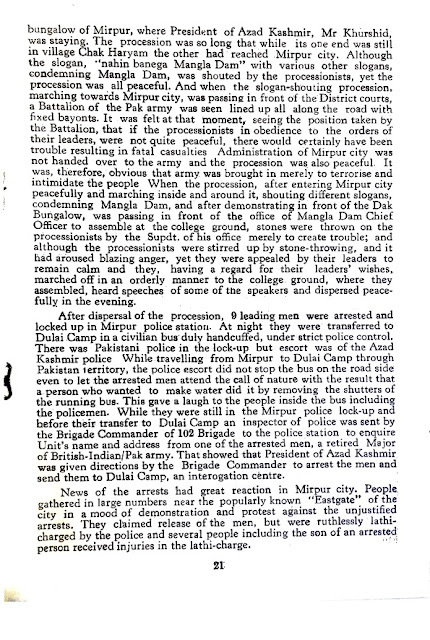 The most revolutionary of young Mirpuris was Ilahi Bux who physically stopped the area’s police chief from disturbing a meeting inside the Jamia Masjid. 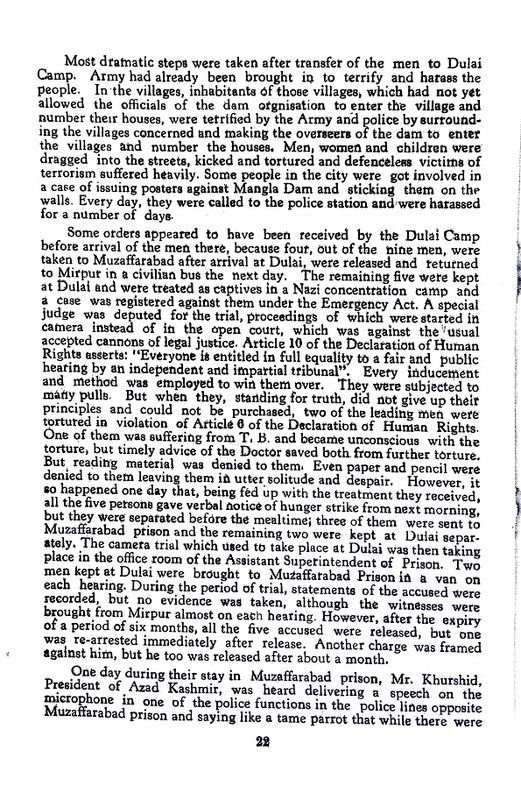 He was overpowered ultimately and jailed, but the people of Mirpur from that day on only knew him as Ghazi Ilahi Bux. My journalist friend from London, Habibur Rehman, a true Mirpuri if there was one, remembers the city where he grew up and went to school, a city now under water. No Mirpuri can visit the graves of his forefathers because every graveyard is now buried in a larger graveyard called the Mangla lake. One of the most revered saints of the area, Ghazi Shah Pir Qalandar, also rests in that watery grave. The people of Mirpur may have been poor but they were always defiant and never took things lying down. 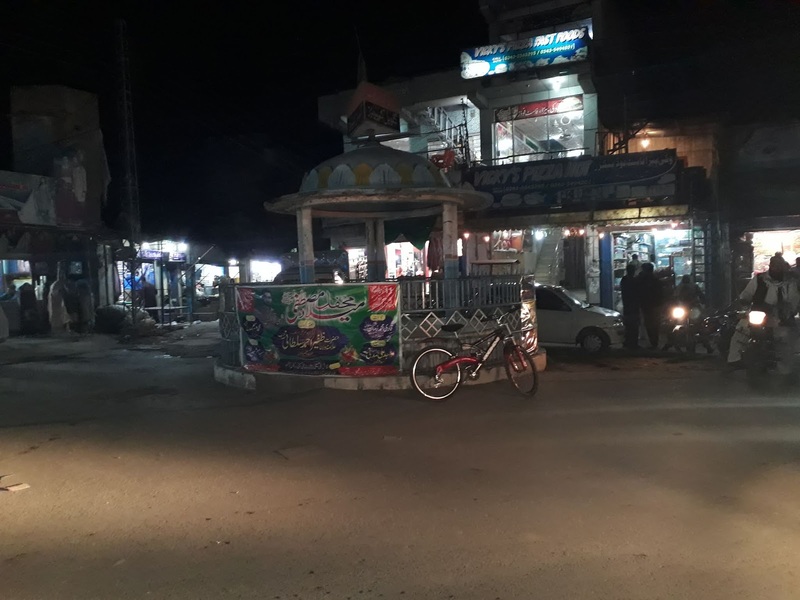 There was no electricity in Mirpur for several years after the establishment of Pakistan and Habibur Rehman remembers that as a child, he and his classmates would go and stand in the evening on a hillock to watch the lights of the city of Jhelum twinkling like glow-worms in the dark. One of the promises made to the people of Mirpur was that since Mangla had been built on their homes and hearths, they would be provided with free electricity when it started generating power. That turned out to be another unfulfilled promise. 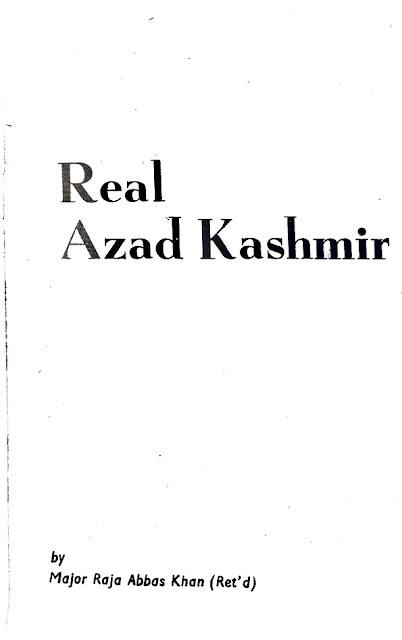 If the government of Pakistan would only pay what it truly owes in royalties, the face of that part of Azad Kashmir can be transformed. One blessing of Mangla to have come the way of the Mirpuris was that they were encouraged to go abroad. In those days, it was extremely difficult to obtain a passport. However, to induce the people to leave, the government issued thousands of passports in the 1960s and since immigration restrictions, as we know them today, did not quite exist then, the Mirpuris travelled to England where there already was a scattered population of Mirpuris, most of them having jumped ship. One such man was the later Chaudhri Zaman Ali, Sitara-e-Khidmat, the elder statesman of the Mirpuri people in Britain. When a huge demonstration was organised in London’s Hyde Park to protest the execution of Zulfikar Ali Bhutto, Chaudhri Zaman, even though he was a very old man then, brought several busloads of people from the Midlands to join a huge crowd that included both Murtaza and Shahnawaz Bhutto. I recall Chaudhri Zaman Ali being lifted by the boys on top of a car from where he addressed the crowd. He always wore a turban with a Peshawari kullah and though he had lived in England for decades, he spoke no more than a couple of words of English. He was a great Mirpuri and was most helpful to early immigrants from his homeland. Syed Sultan Shah never got over the destruction of his city. In his words: “With my own eyes, I have seen not the wrath of God but aggression committed by men erase what our ancestors had left behind to remind us of them. Our historical monuments, our mosques, our shrines, even our graveyards were obliterated. It was as if they never were. Our people were uprooted from their homes to wander the world. Many went into exile.” One can only hope that this sad history will not be repeated, although one fears that, once again, the last thing on the rulers’ agenda will be the people whose lands, no less than their lives, are to be inundated and consigned to oblivion. Khalid Hasan died in 2009 and the archives of his prolific writing which were available previously at http://khalidhasan.net are no longer so. This is yet another aspect of the tragedy that is Jammu & Kashmir. I have ventured into obtaining eye-witness accounts of the turbulence staged in this territory, particularly during the months of October and November in 1947. Here's a particularly poignant piece by Pt. Bishambar Nath Sapru, a Kashmiri Pandit stuck in Muzaffarabad when the tribal Pathans invaded. 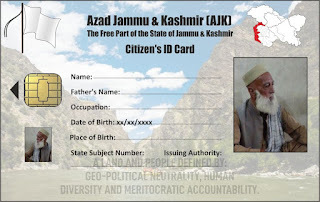 As improvisation and constant public feedback are a big part of what we're doing in AJK, it was obvious that we would edit and re-vamp the AJK Citizen's ID Card as we passed from one phase to the next. A lot of demand has erupted for it from co-citizens, to the extent that we almost have one citizen working full time on making digital copies for them. It is still a digital concept and we have much more to do before it can be launched for practical use in the public domain. Transmission lines for the Neelam-Jhelum Hydro Project which are taking 969 MW of electricity directly from where it is produced in AJK to Pakistan, are not just creating environmental destruction in the Muzaffarabad region but also exposing this area - Tain in Poonch division - to electric currents. Despite numerous attempts to make the AJK government and Pakistan's WAPDA (Water and Power Development Authority) address this issue over the past couple of months, nothing has been done thus far. Notice how the locals are using an electric current tester to explain how their health is being directly affected. These currents are affecting all living beings and when it rains, the locals are further exposed to something which they have no stake in whatsoever. AJK is paying in every way for Pakistan's belated development needs and furthermore, the Pakistanis firmly believe that they don't even need to consent the AJK government (or its people) on what they are extracting from this territory. Meanwhile, I've decided to cut back on analysing fresh news from AJK - for the meantime till I complete the extended version of the Citizen Public Opinion Survey - as everything requires time which otherwise needs to be devoted to work already completed yet not organised (streamlined). However, the video above is yet another pointed example of Pakistan's near absent governing structure in the region. The following is the third round of an attempt to enter the comity of nations who compete to play in the most popular sporting event in the world every 4 years. From the AFC (Asian Football Confederation) in July and September, in November we are trying to contact FIFA directly to assist us in our quest, however outlandish it may seem at this stage. There are interesting precedents to examine. For example, Palestine, Taiwan, Macau, Hong Kong, China and Guam all compete separately for a qualifying slot in Asia. Indeed, in Europe the United Kingdom has separate competitors in the shape of England, Scotland, Wales and Northern Ireland. So, operating as a distinct de facto sovereign nation state is not a precondition to enter the qualifying stages of the FIFA world cup. Yes, we have a very rusty network, live in a conflict zone and lack institutional evolution in sport (and governance in general) but we have a rich base of potential talent - at home as well as a pool of talent and resources in the diaspora. Being positive and persistent in our approach could help us leapfrog our way ahead of many other footballing nations. For example, the UK is not only the inventor of the modern version of football but also accomodates our largest diaspora, where at least two generations of ours are heavily involved in the sport or take fanatical interest in it. This may not be the appropriate forum to resolve this issue but as we can't send a query to FIFA.com's webpage despite numerous attempts and earlier couldn't contact AFC either, we are sending this letter to you hoping that you can guide us appropriately. Thank you for your prompt response. Could you please guide us to the right forum, if possible? Thank you for your prompt response once again. We remain clinging to thin air. It is almost certain that we need a citizen of AJK on the ground in Zurich, to concientiously take our case forward. Studying biometrics for civil identification methods and trends associated with this subject globally. The massacre of Muslims in the Jammu province in 1947 is commemorated on this day every year. It is difficult to ascertain accurate figures because it is a less talked about series of events. However, I am keen to understand this aspect of the ensuing bloody divide of my motherland. Amongst the most prominent writers this land has produced was Khalid Hasan, his book: 'Memory Lane to Jammu' would be an exception in this regard. Even women from both sides.Any solution fry them will hold. Not so, a made in Pak or made in India solution which unravel for politic gains. In pursuit of a fitness regime and level that counter-balances the mental exertion required in processing and creating information. Left Mirpur with my reborn bicycle at 1500hrs...pedalling all the way around the Mangla Dam to Dadyaal was my initial target. Reached Mawa at just past 1900hrs. It was now dark, cold and I was exhausted. 40 kilometres in about 4 hours wasn't bad considering I haven't ridden a bicycle for over 6 years. I am not going to capture Rome in one day I thought. Dadyaal was still another 25 odd kilometres away. So, I jumped into a Dadyaal-bound coaster as it approached. The local fruit and vegetable vendor was exemplary in his hospitality of keeping me company and ensuring that I got on the right vehicle to get me home. On the banks of what is described as Mangla Dam. Fishing for my share of the national treasure. 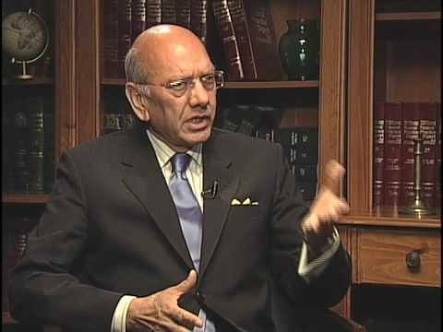 Sardar Khalid Ibrahim is no more with us. From 1948 to 2018 he was almost always available to meet, to have a friendly and informative discussion. For him to be not available any longer, is a loss many of us will regret. Me certainly, I had been preparing for a meeting with him for over a year now, on a consensus building measure in AJK. I spent the summer in his home city of Rawalakot. Yet, I didn't make the effort. Deep down I felt the time wasn't right. That I would meet him after the publication of my extended version of the Citizen Public Opinion Survey Report. Alas...I will live to regret my decision. I needed him for his un-paralled opinion and advice. He was always very humble about his stature but very bold and frank on giving his opinion. In 2009, at his home in Islamabad, Pakistan he was a lively and engaging host. He felt the history made by his father would pave the way for other people to make history too. It is very cold today in Dadyaal....icy winds have swept in from the North where many parts of AJK have seen their first day of snowfall. So, out of the 3 'adversaries' mentioned yesterday, we've proved our edge over Pakistan in our own territory, once again. It will take us more time, tact, will power and resources to overcome the machinations of the UK and India. The road to salvation for the State of Jammu & Kashmir begins in AJK. The book stall that was disrupted in Abbaspur Festival 2 days ago, re-took its position yesterday and continued un-interrupted throughout the day. We've sworn to protect our 'garden of roses'. Despite threats from the administration (read Pakistani clandestine agencies operating via proxies in the local AJK admin/police) - never mind the rain and icy weather - we (civil society) kept a constant vigil (of the book stall). Don't forget that the admin had raided the stall and closed it down last night. We kept it open all day today under our protection. The very books that the admin had given us written instructions to take off public display and threatened to break up the stall if visible, were the very books we put most prominently in view for the public. The public purchased those very books in the highest quantity. What is written and photographed in the facebook embed below is all 'fine and dandy' but how do we access this "detailed" and "full fact finding" report? I found the report yesterday evening and consider it to be thorough about Indian-controlled Kashmir but almost non committal on AJK and GB. Yes, it does have a proviso on these areas and urges the Pakistanis to do some inward soul-searching (these are my words) but it isn't specific or detailed enough. A lacuna persists as does my perception given the crowd surrounding Chris Leslie MP. "When a State or nation is to be enslaved, preliminary steps include depriving the concerned inhabitants of their history followed by erasure of that State's geography. 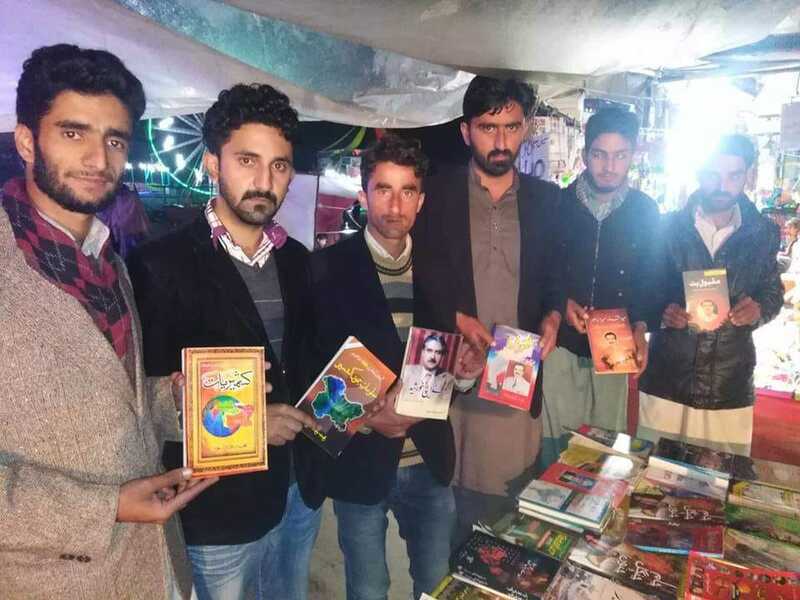 A group of friends belonging to the Jammu Kashmir National Students Federation (JKNSF) had set up a book stall at a local festival in Abbaspur (district Poonch) a few days ago, where the enemies of the State (read Pakistani clandestine agencies) and their local lackeys forcefully broke up the stall this evening (Thursday 01/11/2018), before banning the student activists from displaying these books in public. The public and youth of Kashmir (referring to AJK as well as the rest of the State of J & K as a whole) should understand the oppression meted out to this State. Furthermore, those that we consider our own (read the Pakistani State) are in fact the enemies of our quest for freedom. This is a point of concern and provocation to act against injustice. JKNSF will vehemently raise its voice. The occupiers should understand that these crazy youngsters will no longer tolerate slavery and that they (agents of the Pakistani State) can no longer suppress our voice." This is yet another way of 'controlling' the public narrative in AJK. From the UK parliament to the streets of AJK. Notice how the language of Mr. Irfan seems at first sight very reactionary. However, it should be remembered that it is a response to decades of suppression. There are hundreds if not thousands of examples of such behaviour by our Western neighbours - who happen to profess the same faith as us - and who created a country premised on an argument that they would be marginalised by the Hindu majority in a united India. Pakistan is perpetrating the very crimes it advocated against. 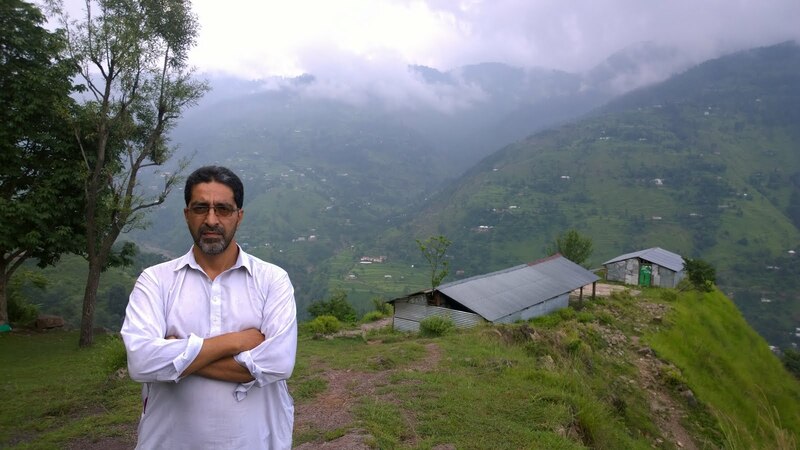 Here's an even more eye-opening aspect of this conflict some call the 'Kashmir Dispute', which marginalises AJK and its aspiring citizens in almost every conceivable sense. The AJK diaspora is not immune from this and the role of India - despite its democratic credentials - is just as shrewd as the Pakistanis in suppressing peaceful democratic engagement between AJK and the Dogra heartland in Jammu. The gentleman in question - Sajjad Raja - has as his introduction on his facebook page the following words: "Long Live Struggle for Reconciliation among Gilgit Baltistan, Azad Kashmir, Jammu, Ladakh & Kashmir." This should describe his innocent intent. However, it has become clear over the years that India and Pakistan will go to any length to prevent any meaningful engagement between these divided parts of the erstwhile Dogra State of Jammu & Kashmir. In this respect, both countries work in tandem as opposed to against each other, which is the most common perception about the 2 countries vis a vis the territory of Jammu & Kashmir. Security clearance could not be obtained for members of Jammu Kashmir National Awami Party (JKNAP) - UK for their party's convention in Jammu on the 11th of November. 7 members from the UK (all originating from AJK) and 1 member of the party from AJK were due to attend this convention. 3 of the 7 from the UK were issued with electronic visas (e-visa) by the Indian High Commission in London. The other 4 were deferred to the regular visa process and their decisions were pending. Ultimately, no response was given in this regard. In the meantime, the party member from AJK was refused a visa by the Indian High Commission in Islamabad, Pakistan. It was decided between party members that the 3 who had managed to obtain visas should proceed to travel to India and onwards to Jammu. Tickets were purchased and all other arrangements to prepare for travel were made. Likewise, arrangements for their stay in Jammu were also completed by the local hosts of the convention. However, on the 11th of October Sajjad Raja received a call from the Indian High Commission in London to inform him that the 3 visas had been cancelled. He was also informed that they wouldn't be able to even board the flight from Manchester via Muscat (Oman) to Delhi. If they (the travellers) managed to get through that stage, they wouldn't be able to board the onward flight from Oman to Delhi and if they managed to get through that hurdle, on arrival at Delhi they would be forcibly put back on the same plane on its return to Oman. Further, that they would be black-listed from ever entering India in the future. These political workers had been preparing for this trip to Jammu for the past 4 months, only to be denied barely days before their journey. Upon enquiry to highly influential people in Jammu, it transpired that this decision had been made at a very senior level of the Indian State structure. So even if you are peaceful, democratic and secular there is little - if any - scope for the divided citizens of Jammu & Kashmir to seek reconciliation and mutual understanding across the LOC. The message is that you will be thwarted, if not by Pakistan then by India. Both are an alibi and guarantor of the other's presence here. I never like commenting on or interfering in how Pakistan is run but the emotions of a certain 'force', in reaction to Asia Bibi's victory in the country's Supreme Court yesterday, have spilled over into AJK. The intersection at Plaak, connecting Dadyaal and Kotli to Mirpur was blocked today. This is a test Pakistan has to get through. Not many people enjoy living in a rough neighbourhood. It may also be an opportune time for Pakistan to start cutting its losses in the Jammu & Kashmir affair. The more it disengages in AJK in GB, the more it can concentrate on upholding the 'rule of law' in its own country.